Brita Been is a textile artist based in Porsgrunn, specialising in tapestry. Her textiles are striking in their appearance, with patterns ranging from the strictly geometrical to gentle and organic. Norwegian Arts spoke to her about her how she started out with tapestry, her influences, and winning the Cordis Prize. In March, Been won the world largest prize for tapestry, Cordis Prize for Tapestry with her piece VINE. The prize aims to reward ambition in the field of contemporary weaving all across the weaving spectrum. “In the end I felt that VINE is powerful, joyous and accessible. It is beautifully woven, deceptively simple, and will delight every visitor to Inverleith House,” Cordis Prize co-founder Miranda Harvey says to BBC. 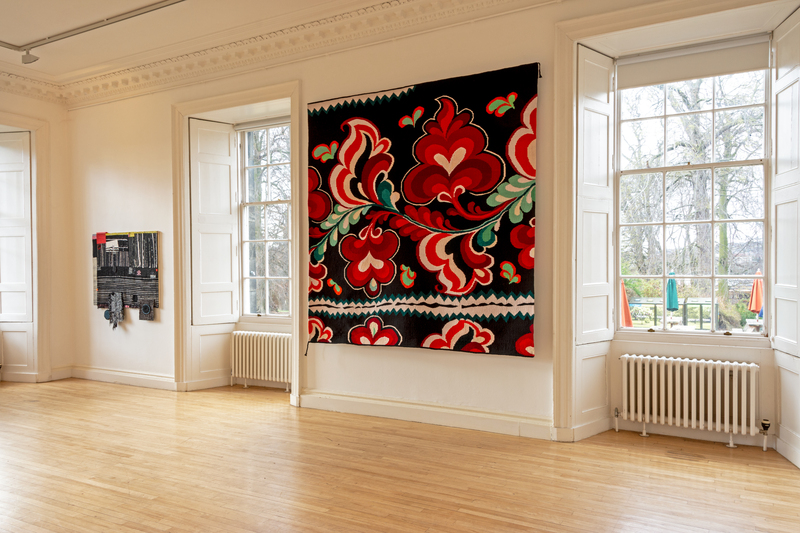 Been’s award winning tapestry will be on display at the Inverleith House Gallery in Edinburgh’s Royal Botanic Gardens until 27 May. How did you start out with tapestry, and what drew you to it as an art form? The interest of weaving started at my Grandmothers’ loom, with traditional rag rug weaving. 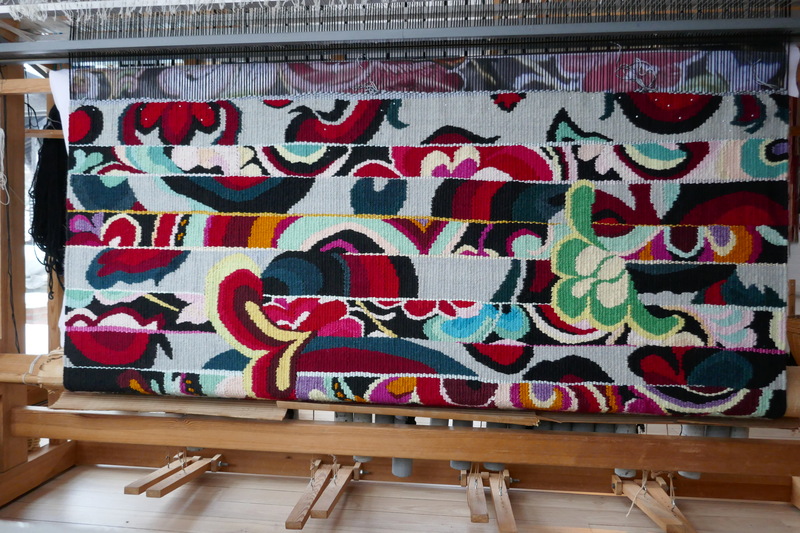 I started my weaving education at the Bergen art and design school in 1969, and since then weaving has been the focus of all my professional work. I have also taught weaving, form and colour for almost 20 years, weaving rag rugs and fabrics since the 70s and tapestries since 1983. Since then I’ve worked mostly with a vertical loom. In the beginning, it was important for me to make tapestries that could also be used on the floor. Now that aspect is not that important, my compositions are freer. I often work in series, and patterns have varied from the strong geometrical to the more gentle, organic forms. This depends on my basic idea at the start of the project. My way of working has developed over time, but I have always called it art, whether you use it on the floor or hang it on the wall. How would you describe your work? What kind of techniques, fabrics and patterns do you use? My tapestries have been characterized as straightforward, proud and strong, with a raw and colourful style. Also daring and dominating, as created for the open room. My works are woven on a traditional warp-weighted loom in traditional Norwegian tapestry technique. The weft covers the warp completely, and the patterns form on the surface the way I designed them. The materials I use are natural: linen thread in the warp and wool thread in the weft. I want my textiles to have a rough, strong character, and therefore I use heavy, thick yarn qualities. I always use the same weaving quality, which also is very suitable for carpets. In any case, I want my woven textiles to have another dimension, beyond the obvious function. They should have their own expression, and be both insistent and dominant. They should be art whether on the wall or on the floor. I dye the yarn myself with chemical dyes. I use my own recipes to attain the exact colours I require and in that way building my own palette. I use all sort of patterns, geometrical or organic. I usually start with photographs of patterns that fascinates me. Then I concentrate on form, with one element or many, and I examine variations of size, structure and colour. This is what gives the numerous of possibilities. Disorder becomes an ordered system when the plane weave is composed and my patterns emerge. What are your influences when it comes to you work? My sources of inspiration are many. I see structures and patterns everywhere: in nature, in traditional folk art, art history, architecture, and fabric design. I also take lots of photos when travelling. Some of my tapestries are rooted in art deco, Bauhaus and functionalism, with close ties to folk art as well. Elements of Chinese ornamentation, Italian mosaics, Scandinavian cloud patterns and classic checks can also be found in my works. Pattern is my passion. Pattern is for me a constant source of inspiration and forms the basis for my compositions. Pattern means movement, repetition, rhythm and liveliness. The pattern’s integral structure gives me the possibility to create and work in the artistic expression I wish my textiles to have, and that fits my chosen technique and material for my works. The weaving process itself also inspire me. When I am working on a tapestry, the next design is in my head. The joy of working, curiosity and energy are what is driving me forward. What does winning the Cordis Prize for Tapestry mean to you? Firstly, I would like to say that this prize is very important when it comes to making tapestry weaving visible as an art form, and it is very generous of Miranda Harvey and Ian Rankin to establish the Cordis Prize for Tapestry. Tapestry weaving is a small field in the art world, and the prize is a great opportunity to highlight the field. To me personally, it means that someone has seen and understood my artistic expression and my work, and valued the result. It is also a huge encouragement to continue working, making all the hours in my studio meaningful. I feel proud and honoured; winning the prize is a great acknowledgement that gives me energy. Can you tell us more about the winning piece VINE from your HEIRLOOM series? What was the inspiration behind it, and how did you come up with the idea for it? The HEIRLOOM project started with an official commission in 2015. 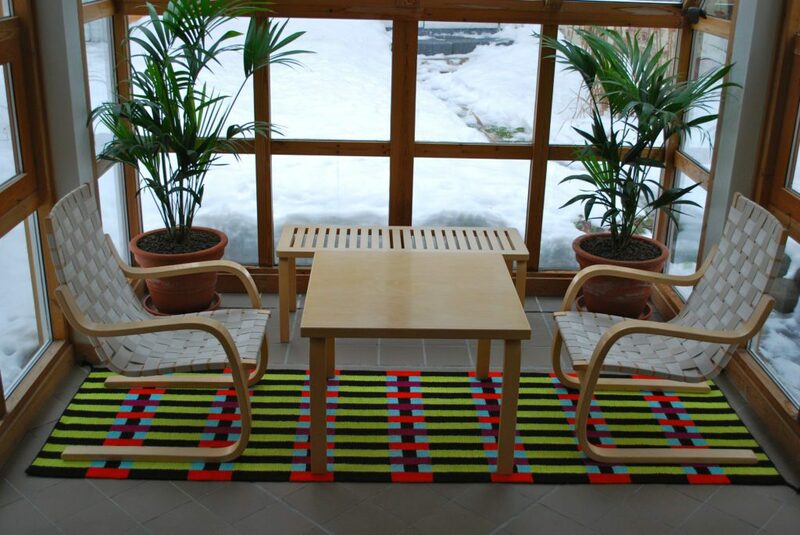 The task was to design and weave a tapestry that would fill the wall in the foyer of retirement home in Telemark, Norway. I was given the task because my tapestries have a distinct quality and design. I wanted to weave a tapestry rooted in the rich textile tradition from the Telemark region, where there is a wealth of pattern inspiration. The pattern would therefore be familiar and have an affinity with the residents and the visitors. The fantastic embroidery tradition called rose embroidery, is strong in the Telemark region and is the inspiration behind VINE and the whole HEIRLOOM series. There are strong traditions in different aspects of folk art, and the traditional costumes from Telemark are known to be rich and colourful. The embroidery lavishly decorate the textiles in stunning colour combinations. Traditional stockings, shirts, braiding, jackets, collars and shirts are all richly decorated and I was fascinated by the beautiful rose embroidery found in countless variations. The tapestry VINE has its origin from embroidery on a white linen shirtfront. I have chosen to weave the patterns on a black background, because black boldly highlights colours and makes patterns stand out. The forms are retained as in the original embroideries, even though the patterns have been revised and adapted to transfer from a shirt to large woven tapestries. 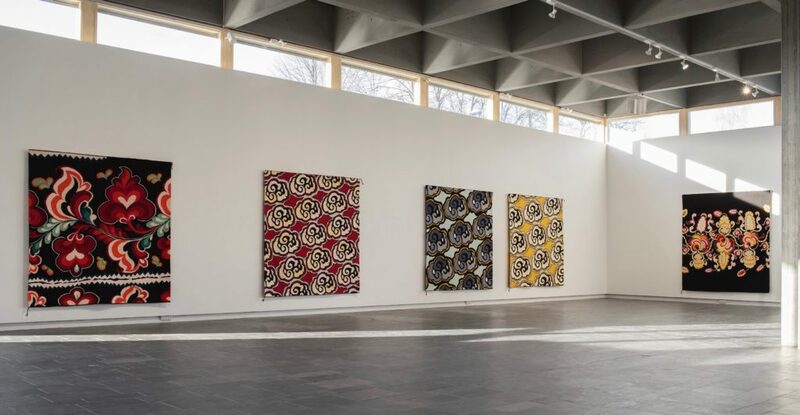 The tapestries are a tribute to women’s creative work, their time and patience, and the sheer abundance these embroideries represented in textile folk art. Do you have any favourite tapestry artists that you feel deserves more recognition? 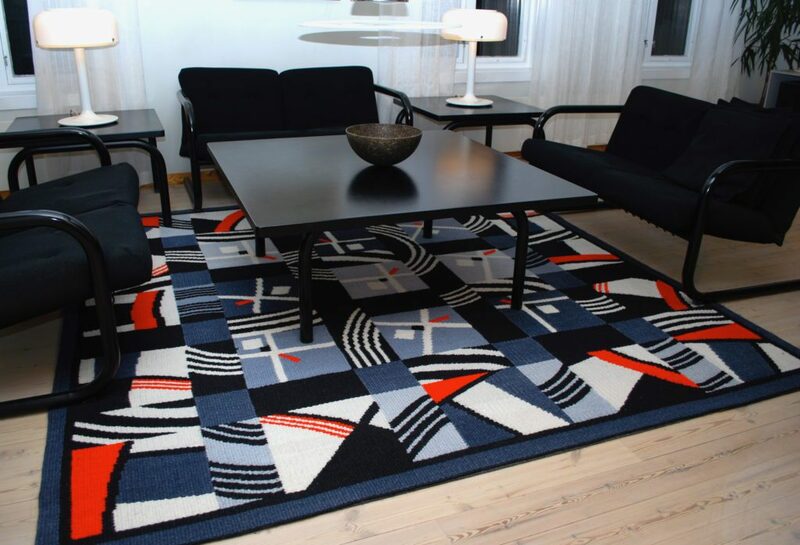 There are many talented tapestry weavers, in both Norway and other countries. All of them deserve more recognition. As I said, tapestry weaving is a small field, even though the interest of textile art is growing. Many of us have expert knowledge, which will soon disappear. What advice would you give to an aspiring artist in your field? They have to have the passion, to believe in what they are doing, to be stubborn, work hard, follow their heart and show what is important to them and tell their own story. See more of Brita Been’s work on her website www.britabeen.no. Her winning piece VINE will be showcased at Inverleith House Gallery, at the Edinburgh’s Royal Botanic Garden from 16 March – 27 May, more information here.